Derry see off Premier Division new boys UCD at the Ryan McBride Brandywell. Eoghan Stokes makes it three on his Derry debut, the 22-year-old's shot deflected in after Ciaron Harkin is again involved. Stokes scored five Premier Division goals for Bohemians last year - and celebrates in front of the jubilant City supporters after getting off the mark at the first attempt. Still 25 minutes to go, but Declan Devine's men are surely home and hosed now. Tonight's league table will be worth a sneaky screen-grab. Derry go 2-0 up in the 59th minute and what a calamitous series of events from a UCD perspective for what goes down as an own goal by Liam Scales. After Conor Kearns plays up the line, Eoghan Stokes sees the keeper off his line and tries an audacious shot from just a few yards inside the visitors' half. Kearns and Scales get into a muddle, with the latter heading the ball into his own net. Conor Kearns, the UCD goalkeeper, makes a fine stop to deny home striker David Parkhouse a second goal and then reacts to keep out a follow-up effort by Patrick McClean. Champions Dundalk are 1-0 down at home to Sligo Rovers, and Bohemians are 1-0 up on visitors Finn Harps. At Richmond Park, St Pat's lead Cork 1-0, while Waterford lead Shamrock Rovers 1-0. UCD are a tidy side with some good players, but don't have the players up front to threaten Derry. I think City should have enough about them to see out this match. All going to plan so far for Declan Devine in the first match of his second spell in charge of Derry City. They lead 1-0 at the break thanks to a goal scored by on-loan debutant David Parkhouse. Scorer David Parkhouse is a nephew of former Derry City forward Stephen Parkhouse, who also played for Glentoran and Institute. David Parkhouse marks his home city club debut by putting the Candystripes into a 21st-minute lead. Ciaron Harkin, himself a new arrival from Coleraine, set it up by pulling the ball back and 19-year-old striker Parkhouse, who is on loan from Sheffield United, side-foots it through a packed penalty area. Although they haven't played here for more than four years, UCD have a decent record at the Brandywell. They are unbeaten in their last five visits, their most recent being a 1-0 win in October 2014 when the students were last in the top division. A splendid sight on the first night of the season, with the Ryan McBride Brandywell almost full to capacity. I think the Dublin clubs are coming back and will be up there competing - and you still have Dundalk and Cork City. So it looks like being a tough season for Derry. If Declan can manage top five in the league and a cup run, he should be more than happy. There are nine new faces in the Derry City team after Declan Devine's busy recruitment drive since being appointed for his second spell as manager. Barry McNamee is given the skipper's armband on his return to the club while former UCD midfielder Greg Sloggett faces his former team on his City debut. Only Eoin Toal and Darren Cole survive from Derry's last game of the 2018 campaign, a 5-0 defeat by St Patrick's Athletic. Video caption: Candystripes boss Declan Devine on his expectations for the season.Candystripes boss Declan Devine on his expectations for the season. Derry City captain Barry McNamee on his return to the Candystripes after a season at Cork City . 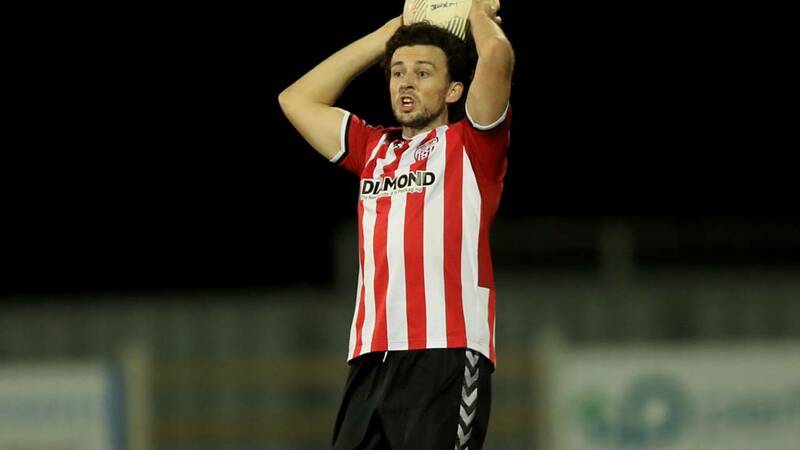 Video caption: New Derry City captain Barry McNamee on his return to the club after a season at Cork.New Derry City captain Barry McNamee on his return to the club after a season at Cork.